Getting into the trail running spirit, I thought I would share one of the trails around Reno that I think is somewhat unknown but deserves a strong recommendation: The Hunter Creek Trail. 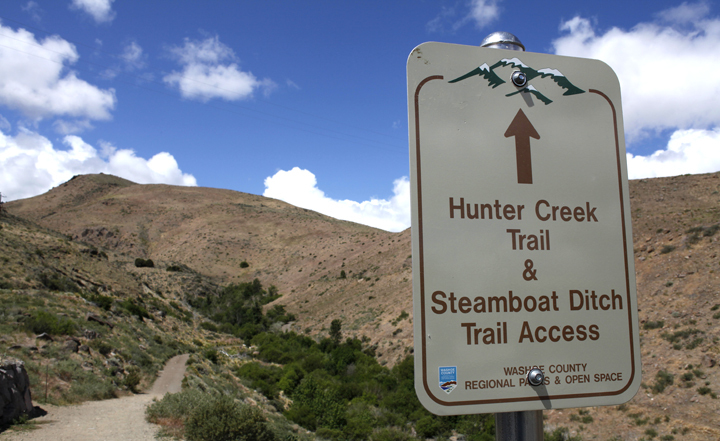 Relatively unknown to even me until recently , the Hunter Creek trail is a beautiful 5.6 mile, out and back route at the foot of the Sierras. 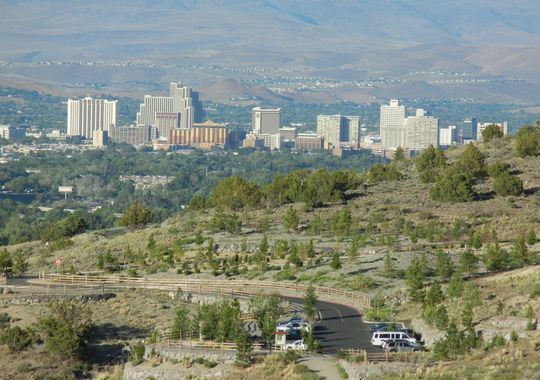 From its namesake, the trail follows the slopes of Hunter Creek Canyon just on the city limits West of Reno. It is primarily a hiking trail, but is open to anyone up to the running challenge and allows dogs and even horses. This trail is rated as moderate to difficult for hikers. Therefore, if you’re looking to attempt this as a first for trail running, I would probably try something else. There is a fairly consistent climb up the first 2.2 miles of the trail, which can get some pretty fit people breathing hard when they’re just hiking it, so this is a definite “no-no” on my beginners list (if I had one). However, taking the plunge for running it is well worth it. It features some pretty landscapes and follows Hunter Creek making it a pleasant, but challenging route. My only experience with this trail has been in the winter time. I know, you would think there would be a ton of snow, but the trail gets a ton of sunlight throughout the day and with a convenient location close to the city (only 10 mins away from downtown) it doesn’t have the typical snow levels you would associate with the Sierras. I also happened to have gone in the weird “70 degree” Reno winter time-frame, so there definitely wasn’t much snow at all. I would recommend getting a pretty early start though, as I have heard it can get pretty hot during the summer months for hikers as there isn’t much shade for the first couple of miles of the trail. Starting out early, however, the trail is shaded by the mountains, so it makes for a nice cool run early in the day. The best part of this trail, in my opinion, is the fact that the last 1/2 mile or so winds through a nice little area of white fir and pine trees ending at an amazing 20 foot waterfall. 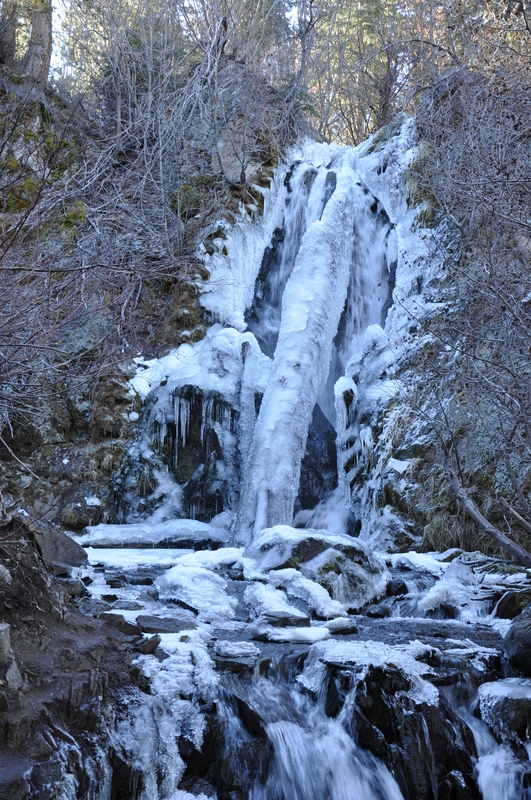 The waterfall is running year round and makes the steady incline to the top that much better. It’s a great place to relax before making the 2.6 mile run back down towards the trailhead. There aren’t a lot of cons to this trail, but it is good to know that it is pretty narrow in some areas along the slopes of the canyon and can get pretty busy. Therefore, I will reiterate that getting an early start is the best option if you would like to run it. There are a pretty good number of hikers that like to enjoy the trail too, so you don’t want to be that jack*** that makes people jump out of the way when you’re running down it. Also, it is very dog-friendly, so don’t forget you puppy friends! If you’ve done this trail or want to in the future, feel free to comment and let me know what you think!